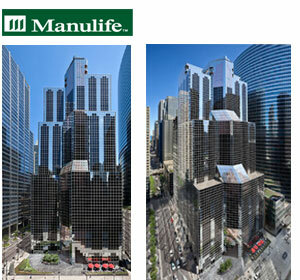 John Hancock, the American division of Canada’s Manulife Financial Corporation, has acquired a 40-storey, class-A Chicago office tower from Harbor Group International, LLC for an undisclosed price. “One South Wacker represents the type of high-quality assets we acquire in key gateway markets where we do business,” Kevin Adolphe, president and chief executive officer of Manulife Real Estate and Manulife Asset Management Private Markets, said in a release. One South Wacker, built in 1982 and renovated in 2014, is a LEED Gold-certified 1.2-million-square-foot office tower located at the prime intersection of South Wacker and Madison streets in Chicago’s West Loop submarket. The central business district tower provides easy access to all modes of transportation and amenities including restaurants, hotels and luxury shopping. The acquisition of One South Wacker increases the company’s Chicago portfolio to more than seven million square feet, making it one of its most active investment markets. Additional Chicago properties owned or managed by John Hancock include 55 West Munroe, 191 N. Wacker, 200 S. Wacker and 150 N. Michigan Avenue. Other key American markets include Boston, Los Angeles, New York City, San Francisco, Atlanta and Washington, D.C. The company operates as John Hancock Real Estate in the United States and Manulife Real Estate in all other parts of the world. Its portfolio consists primarily of office and industrial properties, as well as select retail and multi-family residential properties, in metropolitan centres throughout Canada, Asia and the U.S. It represented assets valued at $16.7 billion with properties totalling more than 58 million square feet as of March 31. Harbor Group is a global real estate investment firm formed in 1990 that has a portfolio worth more than $3.5 billion that encompasses more than 10 million square feet of commercial properties and more than 20,000 multi-family apartment rental units.